"More painter than public artist, I have had the opportunity to collaborate with Stephen Miotto in the translation of painting to architectural scale, glass mosaic. For me there is an affinity between the two mediums. The quality of painterliness and nuance may be achieved in mosaic with the range of colored tesserae in the hands of Stephen Miotto, a master mosaicist. A spirit of idiosyncrasy may be captured." Northwest painter Joanne Hammer creates artworks that explore concepts of time and intuition. Her work has been exhibited internationally in museums in Switzerland, Holland, Canada, Japan as well as across America. Public Art commissions include Seattle International Airport, the Seattle Justice Center and Eastern Washington University with site specific, architectural scale mosaics. Her work is also in many public, corporate and private collections. 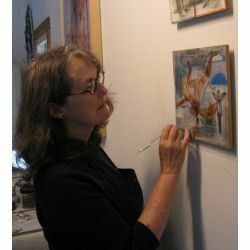 The possibility for contemplative life and connection to natural beauty on the island in the Puget Sound region where she lives and works has been fundamental to her process of making art.